What appeared to be a simple post, quickly turned into a much more complex story. The 45 cent self-adhesive coil stamp design was introduced in July 1994. The letter A representing the sender and B representing the recipient of the mail. 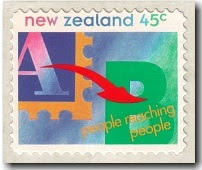 In June 1995 Leigh-Marden advised New Zealand Post that they were withdrawing from the stamp printing business and an order was placed with Sprintpak Pty Ltd to ensure supply continuity. In October 1995 postal rates were decreased and printings were done by both of the companies mentioned above. So this leaves us with four different but easily identifiable varieties as can be seen in the group above. First Day Cover - 20 July 1994 (45c). 45c A to B Coil Stamp - Leigh-Marden. 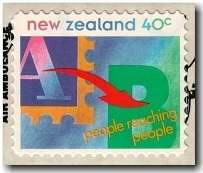 45c A to B Coil Stamp - Sprintpak Pty Ltd.
45c value as printed by Leigh-Mardon, Australia. These stamps can be identified in three different ways. 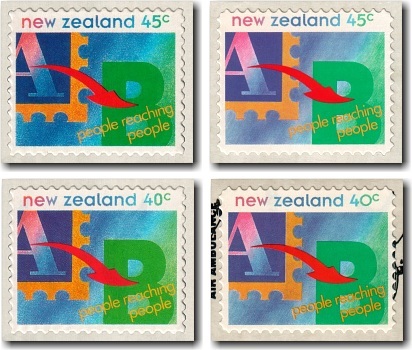 Most of the 45 cent coils were printed by Leigh-Mardon Pty Ltd and the majority of the 40 cent stamps, introduced after the reduction in standard letter rate, printed by Australia Post - Sprintpak. 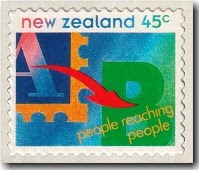 The stamps are most easily distinguished by checking for a dot above the 'i' in the slogan "people reaching people" - the dot is missing on the Leigh-Mardon printed stamps but always present on the Sprintpak stamps. Secondly, the 'w' in "new zealand" is more magenta in the Sprintpak printings so it more closely matches the colour of the rest of the word 'new'. Finally, the Australia Post-Sprintpak stamps have blunt die-cut corners and are perf 11¼ for the 45 cent stamp and perf 11½ for the 40 cent stamp - rather than perf 11 for the Leigh-Mardon printings. As explained on the NZ Post website - Apart from slight colour differences the Australia Post-Sprintpak stamps have 'rounded' die-cut corners as opposed to the Leigh-Mardon variety that has 'pointed' die-cut corners. 45c value - as printed by Post-Sprintpak Ltd - Australia. The design was modified and reissued in October 1995 when the standard inland postage letter rate decreased from 45 cents to 40 cents. I would have expected they would have taken this chance to correct the difference in colour of the 'w' and the missing dot but this doesn't seem to have been the case. 40c A to B Coil Stamp - Leigh-Marden. 40c A to B Coil Stamp - Sprintpak Pty Ltd.
40c value as printed by Leigh-Mardon, Australia. 40c value - as printed by Post-Sprintpak Ltd - Australia. First Day Cover - 2 October 1995 (40c). 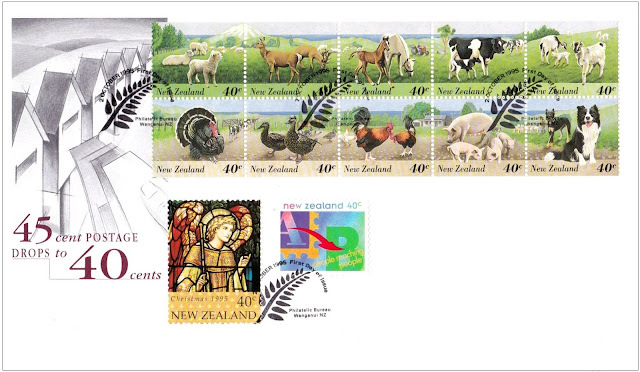 Notice that in this case there was not a special FDC for the A to B Coil, instead, it was combined with the 1995 Farm Animals Booklet. I like how you identified the four variants of this stamp. To tell the truth I have not taken much notice of them. Going to take a closer look now.